I've noticed that when going through materials to review I tend to cherry-pick stuff I like the most and leave the rest, still mostly good stuff, for review "later". This would explain why most of my reviews are 5 Star reviews. I probably need to just pick some items at random and go to town, but not quite yet. Even though I've decided to stop using paper miniatures, I still seem to have a soft spot for them. Printable Pawns, from Fantanomicon Press, is probably one of the better offerings of this nature I've seen. Fantanomicon has four different sets of Printable Pawns and the Basic Dungeoneers is free to download off of Drive Thru RPG. the same with awesomely detailed painted minis. They look great in your hand and in pictures, but in play one Dwarf looks much like another unless the colors are different. 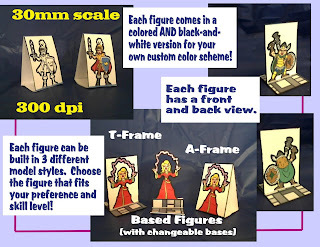 These Printable Pawns come outlined in thick black which makes the figures "pop". This outlining also smooths out the fine edging of the figures quite a bit and it allows you to cut out the figures much more easily, should you choose to do so. Cutting out the figures can be a bit of a PITA, but it does really make for a great miniature. While a nice touch, the outlining in and of itself isn't all that special. What really sets Printable Pawns apart are the instructions and the options. Included with the Pawns is a 9 page instruction booklet. This booklet is laid out simply and is quite easy to follow. Unlike pretty much every other instruction book/PDF product I've seen. The extent of the advertising for Fantanomicon Press is a logo, a copyright notice, and a welcome paragraph. I don't think I've seen paid products with less. 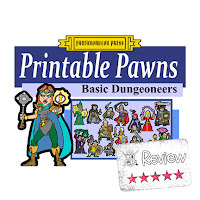 Instead of one PDF with a variety of printing options you have to toggle through, Printable Pawns simply gives you all the Pawns set up three different ways: A Frame, T Frame, and Based. You are also given a couple different bases to use. There is only one minor quibble I had about Printable Pawns, and that is that the cut and score lines are pretty thick and after printing and cutting/scoring they will be a little too prominent on those figures and bases. Overall, this is a great seat and realistically it is one I would highly recommend to those wanting to try out paper minis for the first time. Thank you very much for the kind words! It is always rewarding to learn that somebody appreciates the work you do. Thank you for trying my product, and for sharing your opinions about it with your readers. I am working on more sets when time permits, and strive to maintain the level of quality established in my current sets.